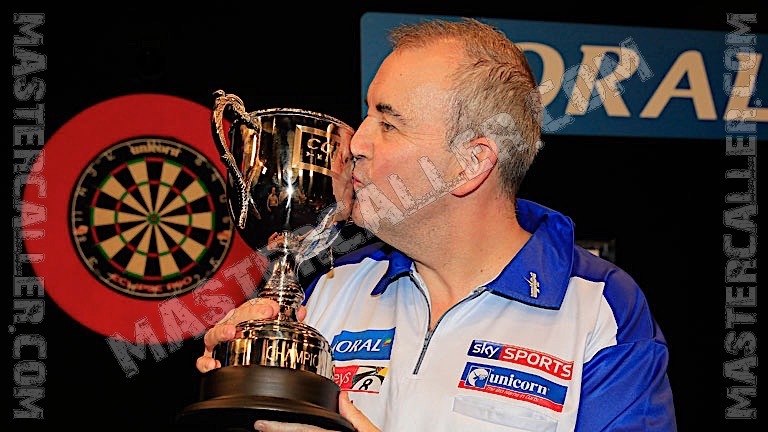 Phil Taylor wins the first edition of The Masters. The number 1 in the world and number one seed is in extraordinary form and defeats all his opponents with ease. In the first round he is 2-3 behind against Terry Jenkins, but from that moment he loses only four legs in the remainder of the tournament . In the final he beats Adrian Lewis 10-1 with a 108.50 average. Lewis plays a great tournament himself with some fantastic thrillers along the way. He beats Belgian ace Kim Huybrechts in the first round while Huybrechts has an average of over 106, but he misses two match darts and loses. In the semi-finals another thriller unfolds against Raymond van Barneveld. In the last leg Lewis finishes from 116 for a 12 darter to beat his Dutch opponent 10-9. The two participants from The Netherlands meet in the quarterfinals and this time it's Van Barneveld who beats his young rival Van Gerwen, incidentally the first time on TV since the final of the Grand Slam of Darts 2012.